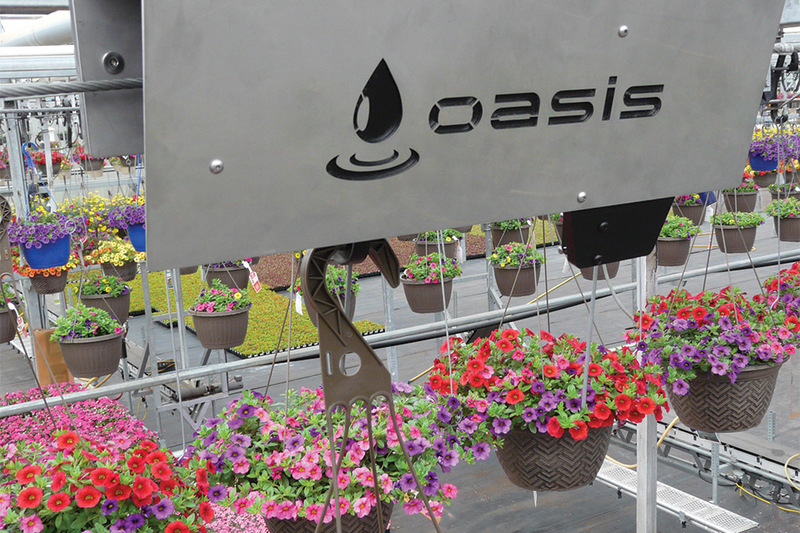 The Oasis uses an electro-mechanical module in which the user sets a pre-determined weight desired for correct plant watering. The process of knowing whether you are giving your hanging baskets the right amount of water can sometimes take a bit of guesswork. It was this dilemma that inspired Michigan growers Jared and Jordan Dekker of Dekker Brothers Greenhouse in Hudsonville, MI, (as well as Len Logsdon, a Controls Engineer and a Master Electrician with more than 30 years’ experience in the greenhouse automation industry) to design a watering solution for hanging baskets that uses the weight of the basket as a starting point. The system, called the Oasis, can be installed on new or existing greenhouse cable conveyors. It uses an electro-mechanical module in which the user sets a pre-determined weight desired for correct plant watering via a local controller, an office PC, or a mobile device. As each basket passes through the Oasis module, its weight is determined. The smart controller opens the proper water valve for only the time necessary to achieve the grower’s target basket weight. The Oasis module is equipped with a Smart Optics sensor that determines if there is a basket present on the hook and whether it is an upper or lower basket. The Oasis system design eliminates the need for tabs on basket hooks and mechanical switches. Early trials of the Oasis proved successful at Dekker Brothers; however, the team at Control Dekk (the name given to the new company supplying the Oasis) knew it was important to get similar results in other operations. Fortunately, they soon began working with nearby Countryside Greenhouse in Allendale, MI, which produces more than 200,000 hanging baskets annually and was looking to upgrade some of its irrigation components. In 2016, Countryside installed the Oasis system on 12 new basket lines in its retail area. The following year, it added 18 more to the basket lines in its production facilities. Jesse Vanderschuur, Countryside’s Production Grower, says there’s been another benefit: less runoff from water in hanging baskets onto pots below them. Bill Kennedy, another Production Grower at Countryside, says it’s been easier to decide when to water knowing that you wouldn’t drown the baskets that were already wet. “The crop in the baskets was equal in weight through the whole system,” Kennedy says. Brian Sparks is senior editor of Greenhouse Grower and editor of Greenhouse Grower Technology. See original article here.